Gears of War is released tomorrow. For everyone who already owns an Xbox 360: this is it! The one we’ve been waiting for! The big game that’s gonna make us proud. For everyone who is unsure about buying an Xbox 360: this is it! The one that’s going to sell the system to you. 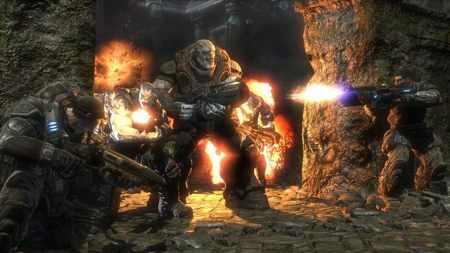 Because let’s face it, if you don’t want to immediately rush out and buy an Xbox 360 after playing Gears of War (and if you don’t want to immediately rush out and play Gears of War after seeing the awesome, beautiful “Mad World” trailer), well… maybe you’re just not an Xbox 360 kind of person. As for me, I’m going to be frantically running around town tonight, looking for any shops that might have released it early My girlfriend is off out of the house tomorrow night so I’ll have the house all to myself to play Gears of War at an eardrum-puncturing volume. Oh boy.